My guess is that this movie is going to Blu-Ray fast and will wind up being a top seller for this Christmas season. The Tragically Hip played their last show ever last night, and I watched the simulcast from my home. I wanted to be out with other Hip fans, but this has been a bad weekend for my health. But there was no way I was going to miss that show last night, and I am glad I didn't. It was one for the ages and it cemented the legend of the Tragically Hip as one of the finest bands to ever play rock music and easily the best band to ever come out of Canada (sorry Geddy). From the moment the show opened, there were things that Hip fans were unfamiliar with. Teleprompters on the stage rolled out Gord's own lyrics for him, and there were road crew always within an arm's reach of Gord. One of the things that I always liked about the Hip is that their stage set up has never changed in 28 years. It was the same when I saw them on New Year's Eve to ring in the new Millennium as it was last night. Just the Hip, their instruments, and Gord. Gord's live performances have always been based on emotion. He has always seemed disinterested in singing every note perfectly, but he obsesses over telling each story with his body and his face. 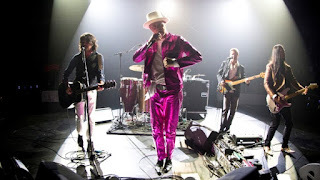 You can tell the media outlets that have ignored the Hip for years as they have been publishing stories claiming that an emotional Gord has lost it at certain points during these summer shows. I looked at some of the videos these outlets were using and it was just Gord being Gord. During A National Celebration, Gord pretended to break down crying and you could see people in the crowd starting to cry themselves. Then he brushed it off and went on to something else. The Tragically Hip has always been Gord Downie's lyrics surrounded by perfect music. It has been the same five guys since day one, and that familiarity shows in every song. The musicians may not understand what Gord is talking about, but they know what kind of emotion he is trying to get across and they bring that to life with their music. The whole package together is something that puts the Hip on a level with some of the best bands of all-time, and that is where they deserve to be. A National Celebration was about Gord, but it was also about the Hip itself. Let's keep in mind that this is the last time that group of guys will ever be anywhere and be called the Tragically Hip again. You would think that four musicians who have played together for almost 30 years may wind up doing a new project together, but it will never be the Tragically Hip again. While April Wine keeps chugging away, the Tragically Hip has seen its road come to an end. There were plenty of tears last night and, while it was a great show, I could also not help but feel the sad undertones of the entire evening. Gord looked tired when the original set was done. He had to be helped off the stage after the second encore. But he could not get enough. He kept going back onstage to give the people what they want one last time. The Hip played every hit I can remember last night, and that is a lot of them. There are very few Hip tunes I don't like, but they covered it all last night. This may be a Blu-Ray I will purchase, or I will just go back to YouTube and watch this at some point in the future. Gord was in key at some points, and he was off key in others. It doesn't matter because that is not the point of a Tragically Hip performance. Gord tells you the story, and the guys in the band paint the picture. That is how it always was, until it all came to an end August 20, 2016. Good luck, Gord. I, and thousands of music fans in the WNY area, want to thank you. You gave us that music we could take with us on vacation and people would say "Who is that? They are awesome!" And with a hint of regional pride, we would inform them that it is the Tragically Hip. The best band from Canada that most Americans never heard of. And for one night, the focus of a national Canadian celebration. George N Root III is a Hip fan who would not have missed last night's performance for the world. Follow him on Twitter @georgenroot3, or send him a message at georgenroot3@gmail.com. Good luck, Gord. And thank you.